Nick and Mario Lulgjuraj are once again investing in the city with a redevelopment project on Jos. Campau. Last time we checked in with brothers Nick and Mario Lulgjuraj, they were building a new shopping strip at Caniff and Gallagher. It was done in a modern urban design, which meant the building was up close to the sidewalk and not set back like you see in the suburbs. That was several years ago and at the time it was a substantial investment. There was concern back then that having parking in the rear would work against the project but that doesn’t seem to be the case. Royal Kabob Restaurant anchors the string of stores located there, and it enjoys a steady flow of eager customers. Now the brothers, who also own and operate Maine Street Restaurant on Jos. 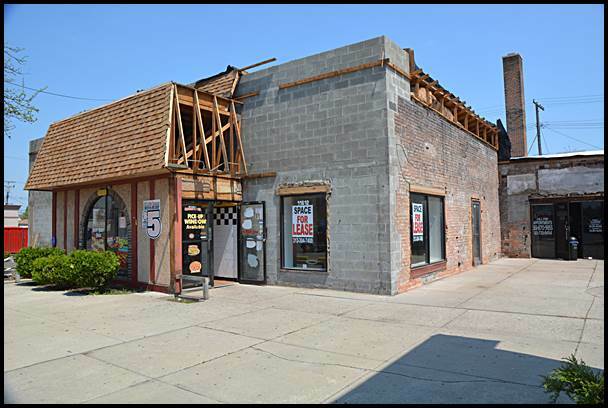 Campau, have purchased the shopping strip anchored by Little Caesar’s Pizza. And as usual, expect to see a major improvement in how it looks over there. Renovation of the façade is now underway. Mario Lulgjuraj didn’t want to disclose how much is being invested in the site, but it’s part of a long-term strategy he and his brother have for the city. The shopping strip is also next-door to Maine Street, on the northern side of the Jos. Campau business district. It’s this part of the district that has seen the most activity when it comes to redesign. You can thank the Lulgjuraj brothers again for that. 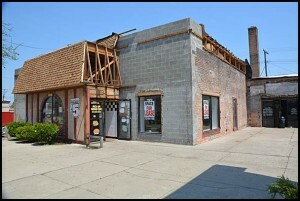 They also bought the building across from their restaurant where several businesses operate. The Lulgjurajs invested money into improving that building’s façade. You could say they are a two-man urban redevelopment team. You heard it building owners, the Lulgjurajs have thrown down a challenge. Anyone want to step up?